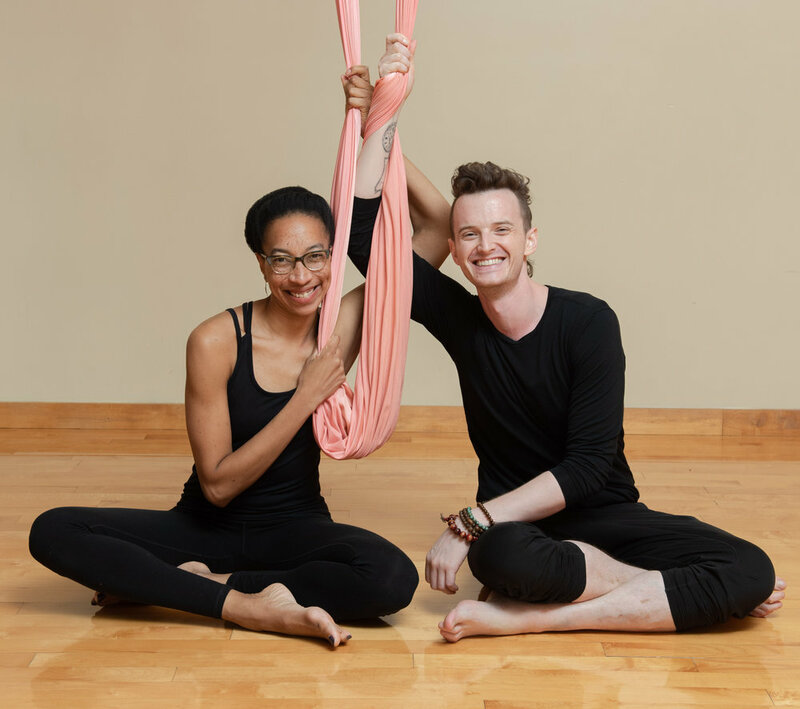 Aerial Mellow Flow is Om Factory’s answer to a Restorative Aerial Yoga Practice, created by Kevin Bigger in collaboration with Maisah Hargett and their students. This class uses the aerial hammock as a tool to create sacred space in the body, mind and spirit. A slow-moving Aerial Yoga flow gently warms the body in preparation for a series of long holds in poses inspired by yin and restorative yoga. Practical applications of pranayama and meditation techniques are often woven into the sequence as well. This exploration makes use of the aerial hammock much closer to the ground than in a general Aerial Yoga class. 10:00 AM - 4:30 PM daily with a one-hour lunch around 12:30 PM. While it would be helpful to have prior experience either teaching or taking Aerial Yoga Classes prior to enrolling in this training, it is designed to be open to any teacher who is interested in adding a new skill set to their toolbox. Interested students who want to treat themselves to three days of lounging in the hammocks are also welcome to join. Participants are eligible for 16 Hours of CEUs from Yoga Alliance®. Kevin Bigger started practicing yoga in his late teens, immediately after a period of massive (less than healthy) weight loss, and just before he (finally) came out of the closet. As he struggled to adapt to a new physical and emotional reality, yoga provided a pathway to organize the chaos. Over the past fourteen years of study, the practice has continued to be his saving grace. Kevin completed his RYT-200 training with Boston's Radiant Yoga School (Chanel Luck and Bonnie Argo). In New York City, he was later whipped into proper shape by Schuyler Grant and all of the rad teachers at Kula Yoga Project and currently studies with Iyengar Yoga Teacher Nikki Costello (including the Enrichment Practice, a 300-Hour Advanced Teacher Training Program). Kevin teaches in the hopes that his offering affords his students the same benefits and opportunities for growth that he received from his teachers. Maisah happened upon yoga whilst looking for a way to keep her body in prime performing condition as a dancer. After many a class that wasn’t quite the right fit she found her gateway drug in Vinyasa; the linking of breath and flowing movement really hit home with her dancing heart. She went on to complete her 200hr training with Yoga to the People NYC (2011) and followed that up with trainings in Restorative Yoga (Mary Aranas 2013), Kids’s Yoga (Asana Alphabet 2014, RYCT), Aerial Yoga (OFSY 2014) AcroYoga (AcroYoga Montréal 2015), Baby Yoga (Asana Alphabet 2016), Trauma-Informed Yoga (Exhale to Inhale 2017) and last, but certainly not least, Aerial Yoga Mellow Flow (OFSY 2013).